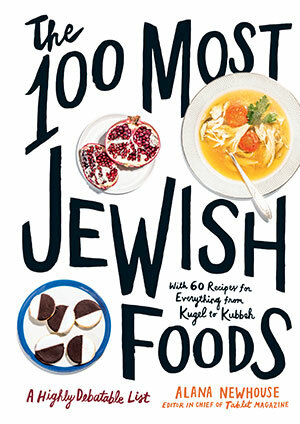 Just as Tablet Magazine celebrates its 10th anniversary, the online culture and news site is releasing its wholly original book, The 100 Most Jewish Foods: A Highly Debatable List. The whimsical, hilarious, nostalgic and, at times, serious collection reminds me of a boisterous dinner party with all your favorite foodies and chefs coming together against the backdrop of a laid-back panel on their experiences with Jewish food. Outlandish as it may be at first glance (yes, even Sweet N’ Low and Stella D’oro Swiss Fudge Cookies get a spot on the list), there is substance here. If you, like me, love a good behind-the-scenes story of food-world politics—especially Jewish-food-world politics set in New York—then you will find this book a real treat. 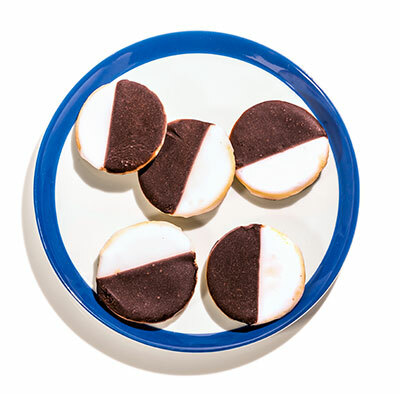 Want to know the backstory to how Oreo cookies became kosher? What’s the deal with Hebrew National hotdogs? Why do American Jews love Chinese food? All those questions and more are answered in The 100 Most Jewish Foods, in captivating explanations that are as thought provoking as they are entertaining. Alana Newhouse. 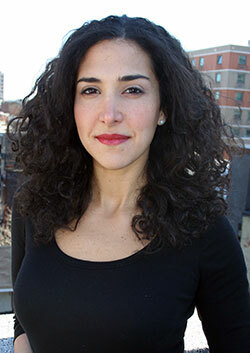 Photo by Michelle Ishay. As far as the celebrity contribution, it is substantial: Zac Posen shares his modernized take on borscht, a recipe taken from his 2017 book, Cooking With Zac. 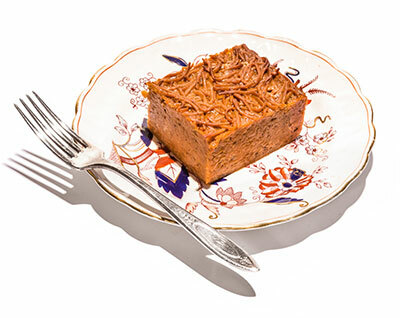 Amanda Hesser and Merrill Stubbs, New York food writers and founders of the influential website Food52, wrote the section on brisket: “Why are two shiksas writing about brisket for an anthology about iconic Jewish foods? Because we are jealous,” they joke in their text. Joan Nathan lends her recipe for lemon and herb stuffed chicken; Adeena Sussman talks dates, comparing the options at her local Tel Aviv shuk to couture gowns and “ready to wear frocks” before ranking them on practicality and velvety sweetness; and superstar chef Edward Lee, who is Korean, recalls the chopped liver sandwiches his Jewish neighbor fixed him as a child in Brooklyn. Chef, restaurateur and farm-to-table champion Dan Barber, of Blue Hill restaurant fame, rewrites the story of Adam and Eve—and what came after—from the apple’s perspective, then shares his apple crumb cake recipe. Phil Rosenthal, creator and executive producer of Everybody Loves Raymond and star of the Netflix show Somebody Feed Phil, writes with enthusiastic nostalgia about the Entenmann’s doughnuts of his childhood. Meanwhile, Canadian journalist David Sax likens the Jewish American delicatessen menu to a “greatest hits” album of centuries of Yiddish cuisine. With a fun, quirky vibe, insertions of cute illustrations and a visual table of contents, the collection is enriched with 60 recipes. 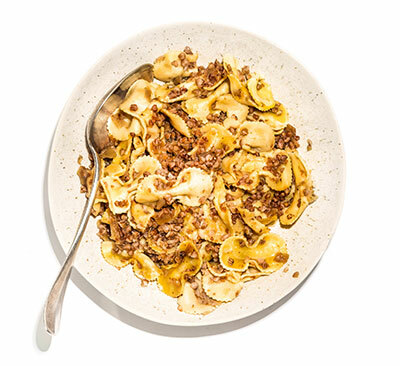 From eggy, lightly-sweet kichel to comforting kreplach, the recipes mostly come from food writer Gabriella Gershenson, who served as recipe editor on the project. Perhaps most fun of all, The 100 Most Jewish Foods will provide you with new talking points for the food debate that is sure to unfold around your next holiday meal. And what could be more Jewish than that? This recipe by Mitchell Davis is excerpted from ‘The 100 Most Jewish Foods’ by Alana Newhouse (Artisan Books). Copyright © 2019. Make the kasha: Combine the water, butter (if using) and salt in a small saucepan and bring to a boil. Meanwhile, place the buckwheat in a wide saucepan, add the egg or egg whites, and stir to combine. The buckwheat will clump together, but don’t worry about it. Set the pan over medium-high heat and cook, stirring continuously, until the clumps of buckwheat break apart into individual grains and start to give off a distinct nutty aroma, 5 to 7 minutes. Pour in the hot liquid, then add the pepper. Reduce the heat to low, cover, and simmer until all the liquid has been absorbed and the kasha has plumped, 25 to 30 minutes. Remove from the heat and fluff with a fork. Set aside. Make the mushrooms and onions: Melt the butter in a large saucepan or skillet over medium heat until warm. Add the onions and cook, stirring now and again, until translucent, 7 to 8 minutes. Add the mushrooms, salt, and pepper to taste and cook, stirring often, until the mushrooms have given off most of their water and the mushrooms and onions are soft, about 10 minutes. Taste and adjust the seasonings, if necessary. Transfer the mushroom-onion mixture to a large bowl and add the kasha. Meanwhile, bring a large pot of salted water to a boil. Cook the pasta until al dente according to the instructions on the package. Drain and transfer to the bowl with the kasha and mushroom-onion mixture. Toss until everything is combined, then taste and adjust the seasonings, if needed. Eat the kasha varnishkes as is, heat them up in a pot on the stove, or make them in the morning and reheat them in the oven before dinner. To reheat, preheat the oven to 325º. Transfer the kasha varnishkes to a 2- or 3-quart baking dish. Pour over about half the stock. Cover with aluminum foil and bake for about 25 minutes. Remove the foil; if the mixture looks dry, pour another 1/2 cup stock over it. Increase the oven temperature to 375º. Bake for 15 to 20 minutes more, until the noodles on top begin to brown. Remove from the oven and serve. This recipe by Melissa Clark is excerpted from ‘The 100 Most Jewish Foods’ by Alana Newhouse (Artisan Books). Copyright © 2019. Position a rack in the upper third of the oven. Preheat the oven to 375º. Line two baking sheets with parchment paper or silicone baking mats. Combine the vanilla, milk, and lemon juice in a small bowl or a measuring cup and set aside. In the bowl of a stand mixer fitted with the paddle attachment, or in a large bowl using a handheld mixer, beat the butter on high speed for about 1 minute, until light and airy. Gradually mix in the granulated sugar. Add the egg and beat until incorporated, then stop to scrape down the bowl. With the mixer on medium-low speed, alternately add the flour and milk mixtures in three additions, starting and ending with the flour mixture and mixing until just combined after each addition; stop to scrape down the bowl as necessary. Use a cookie scoop or a tablespoon to drop 1-tablespoon mounds of dough onto a prepared baking sheet, spacing them about 1 1/2 inches apart. Bake in the upper third of the oven for 8 to 10 minutes, until the cookies are firm to the touch and fragrant. Repeat with the remaining batter. Let the cookies cool on the baking sheet for 10 minutes, then transfer them to a wire rack set over a sheet of parchment paper. Turn them over—the flat underside will become the top side of the cookie for easy glazing—then cool completely. Make the glazes: Combine the confectioners’ sugar, 1/4 cup of the milk and the vanilla in a small bowl and stir until smooth. Holding a cookie in one hand over the bowl of glaze, use a small spoon to scoop up the glaze and pour it over half the cookie, then, with the back of the spoon, move the glaze around to completely coat half the cookie. Push any excess glaze off the edges so as to fully cover the half. Return the half-glazed cookie to the rack. Repeat with the remaining cookies. Add the cocoa powder to the glaze remaining in the bowl, then add a teaspoon or two of additional milk, just enough to loosen it—you want it opaque enough to cover the cookie, but thin enough to be workable. Mix until smooth. Glaze the unglazed half of each cookie as you did with the white glaze. Return them to the rack to set for 30 minutes before eating them or packing them up. The cookies will keep in an airtight container at room temperature for up to 3 days. This recipe by Michael Solomonov is excerpted from ‘The 100 Most Jewish Foods’ by Alana Newhouse (Artisan Books). Copyright © 2019. Cook the noodles according to the package directions. Drain, transfer to a bowl and set aside to cool. Immediately pour the sugar and oil over the noodles and toss with tongs to distribute and separate any lumps (some will remain, which is fine). Let cool to room temperature. Mix the eggs with the salt and pepper in a medium bowl, then add them to the noodle mixture. Toss together to distribute. Transfer the mixture to a 9 by 13-inch baking pan. Cover the pan with aluminum foil and bake for 30 minutes. Remove the foil and bake for 30 minutes more, or until the kugel is browned on top and you can see crispy noodles, especially in the corners of the pan. Serve hot or warm. Love the book–but why no felafel?